This Lamp Features A Large Steel Arc, Finished In A Plated Brushed Nickel, Set In A Burnished Stained Solid Wood Foot. The Round Hardback Drum Shade Is A White Linen Fabric With Natural Slubbing And Plated Brushed Nickel Trim. The Shade Adjusts At An Upward Angle. 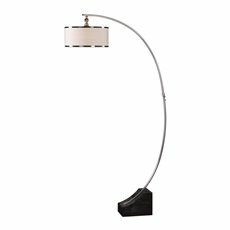 Frame: This Lamp Features A Large Steel Arc, Finished In A Plated Brushed Nickel, Set In A Burnished Stained Solid Wood Foot.